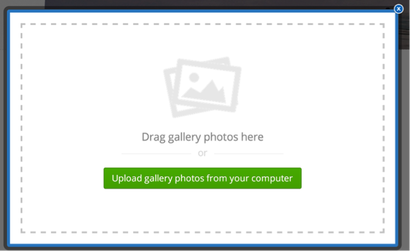 And either drag images into the box or click the big green Upload Photos button. This will let you select images from your computer to upload. 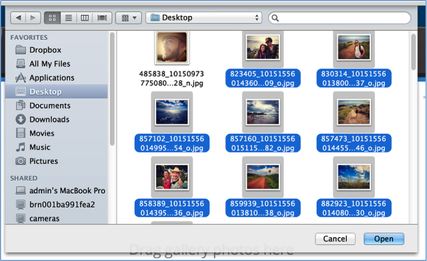 You can select multiple images by holding the CTRL key on a PC or the Command key on a Mac. If you have trouble uploading images, we'd recommend limiting the number of images you upload to no more than 25 at a time. You can always add more later. Each image in the gallery automatically links to a larger version of the image. 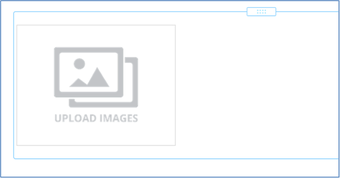 You can also link an image elsewhere (another site or page) if you like or add a caption that will appear on the enlarged version of an image. Click on the gallery to see these options. Click on thumbnails and drag them around to rearrange images within the gallery. The gallery's toolbox enables you to make additional changes. Determine the number of columns you want. The default is three, but you can use from 2 to 6. Add Captions. You can choose to show captions either as full or partial overlays on the thumbnails and select if the overlays should show all the time or only on hover. And with Advanced, choose if you want a border around each thumbnail or not. 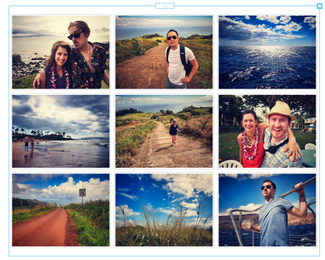 And select if you want to crop the thumbnails to either squares or rectangles. This cropping has no impact on the enlarged images - it only changes the look of the thumbnails to make the gallery look more uniform. Up next, add Social Media Icons (Facebook, Twitter, Pinterest, Google+) to your site.